The MANGO Hiking Club Takes to the Streets again on Sunday, February 22nd! The Mango Athletic Club of San Francisco utilized team sports to bring the Filipino-American community together during the 1940s-1950s. Participants learned about health and fitness and were rewarded with fellowship and lifelong friendships. In this same Spirit of fitness and fellowship, the MANGO Hiking Club invites one and all to join us as we explore the natural world of the San Francisco Bay Area through monthly moderate level hikes. Additional Notes: Wear comfortable shoes and clothing and bring lots of water. PLEASE RSVP! Please email Theresa Imperial at thrsimperial@gmail.com with your name and how many other people are coming with you. 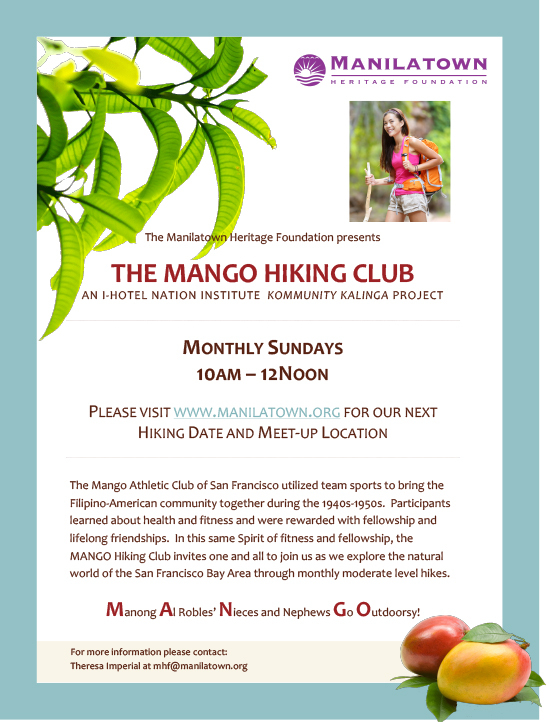 Please visit: http://manilatown-heritage-foundation.org/events/#mango for future hiking dates and meet-up locations. Previous: Klick on a Brick Spring Quarter Begins April 4th! Next: Hungry Ghosts Exhibit Opens April 2nd!